The opto-mechanical handheld probe is a versatile tool for industrial and medical measuring and 3D positioning tasks. 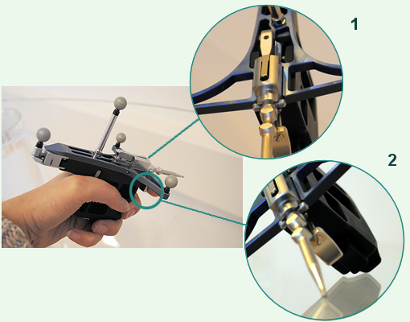 The certified medical device is completely autoclavable (sterilizable) and provides an optical link between probing device and stereo-measuring system instead of the usual tactile communication with the computer, e.g. via keyboard, mouse or foot-switch. 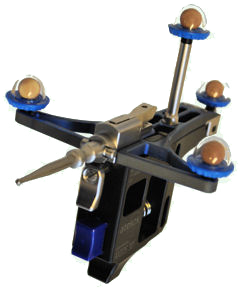 In connection with an optical stereo measurement system, the function trigger can be used, among other applications, to control software: Probed points can be registered and digitalized. Similar to right and left clicks with a computer mouse, the handheld probe offers the use of the trigger on two function levels. The handheld probe is patented under the patent number 1498688. It is manufactured by Atesos medical AG in Aarau (CH). The probe pointer can quickly be replaced via a simple and clever mechanism. This enables the integration of your own customized pointers at any time. The trigger is easily manageable with the users’s index finger – A good grip on the handheld probe is made possible by a sturdy handle. It is therefore possible to handle probing and triggering in one smooth motion with just one hand.